If your looking for a fast, efficient way to dispose of your waste in Surrey, Berkshire, Middlesex or SW London then give JLS Haulage a call today. Grab hire is a great low cost alternative to hiring a skip. Our modern lorries load up to 16 tonnes of waste in a single visit and you do not require a permit. A long established, family run business with many years of experience in this industry, we are here to here to help, advise and answer any questions you may have when looking to get rid of any type of waste materials. We pride ourselves in providing a fast, reliable service - from the moment you first contact us you’ll find our staff are polite, knowledgeable and courteous. Our drivers and operators are highly skilled and fully insured. We are licensed waste carriers and committed to our green policies which mean that nearly all of your waste is recycled. If you would like more information regarding our grab hire services please do not hesitate to contact us today. We welcome all enquiries and are happy to pass on our expertise and discuss your needs in more detail. In addition to Grab Hire we also provide a house and garden clearance service. If you need to de-clutter, are moving house or need site clearance we can help. We collect, clear, load and dispose of rubbish from lofts, sheds, garages as well as commercial premises such as shops, offices and factories to name a few. Grab hire services in Staines, Chertsey, Camberley, Egham, Guildford, Woking, Richmond, Twickenham, Kingston, Wimbledon, Ascot, Bracknell, Slough and throughout Surrey, Berkshire, West and South West London. 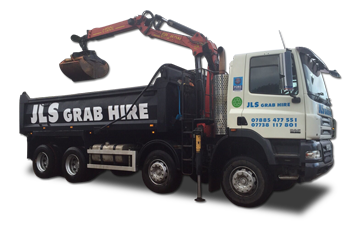 JLS grab hire, your first choice for grab hire and muck away in Surrey, Berkshire and London.